Multi-NIC support: A network interface (NIC) is the interconnection between a VM and a virtual network (VNet). A VM must have at least one NIC, but can have more than one depending on the size of the VM you create. 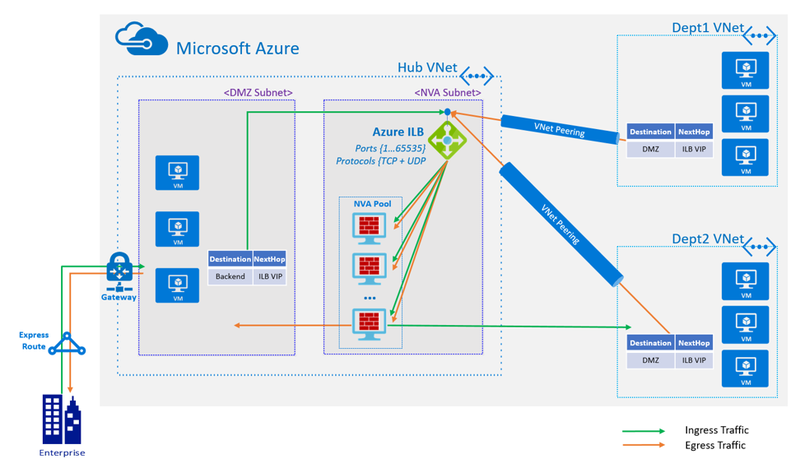 Learn about how many NICs each VM size supports for Windows and Linux in our documentation, “Sizes for Windows virtual machines in Azure” or “Sizes for Linux virtual machines in Azure.” Many network virtual appliances require multiple NICs. With multiple NICs you can better manage your network traffic by isolating various types of traffic across the different NICs. A good example would be separating data plane traffic from the management plane and hence the VM supporting at least two NICs. A VM can only have as many network interfaces attached to it as the VM size supports. If you are considering adding a NIC after deploying the NVA, be sure to Enable IP forwarding on the NIC. The setting disables Azure's check of the source and destination for a network interface. Learn more about how to enable IP forwarding for a network interface.